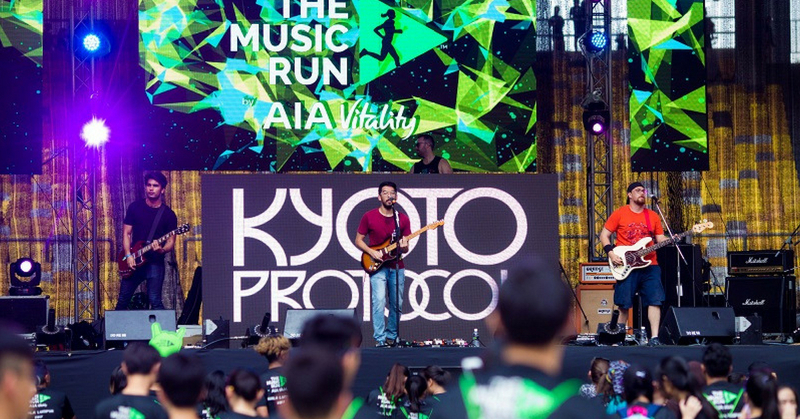 The band who pieced together “Now You’re Gone”, Kyoto Band aka Kyoto Protocol is a 5-piece band who has their fair share of humble beginnings before getting more recognition and subsequently releasing their very own full album Catch These Men back in 2016. As we inch closer to GVF2018 which coincides with the release of their new album, we get up close and personal with the men behind the band to talk about their experiences as well as upcoming plans for the months to come. 1. Hi Kyoto Protocol, please tell us more about yourself. 2. We absolutely love the music video for ‘Now You’re Gone’. Can you tell us more about the song and the idea behind it? The song is about breaking up but not being able to move on. The music video was the brainchild of Razlan and Adriana of Denshouse Co who truly understood the lyrics and the feeling of the song to a tee. When I watched the music video for the first time I was in tears. That was precisely the feeling I had when I wrote the song. 3. We understand that you’ll be releasing your new album at #GVF2018. Can you share with us on your journey putting this new album together so far? FUAD: The journey has been an interesting one for us. It’s the first time pretty much that the whole album was freshly written. It’s also fascinating to let our instinct guide the musical direction and then taking a step back to marvel at the new sonic ground that we’ve covered. It’s also our first time working with Maveriq Studios and it’s been an amazing experience so far. They are consummate professionals! The product, we think, is probably the best music we’ve made thus far. From a personal perspective, I’ve definitely developed my skills as a songwriter and am glad to say that lyrically I’ve managed to break new ground as well. The sources of inspiration happened to be a lot more from documentaries, and then using the newfound knowledge as metaphors for things that I was going through in my life. 4. Are there any exciting plans which we can anticipate for the coming months in 2018? SHAQ: It goes without saying that Good Vibes is at the top of the list, After GVF 2018, we have plans to play several locations around Malaysia and overseas, one of them being Japan, which will be in September. To know more of when and where we are playing, you can always check out our website kyotoband.com. Also look forward to awesome music videos! Especially if you liked “Now You’re Gone”, we’re looking to take it up a couple of notches. 5. What is a typical rest day (sans music) for the band? FUAD: When there is absolute rest, since we all have day jobs, I reckon we just become Regular Joes. If there’s one thing, I think all of us try to be active with sport or some kind of physical activity. Most of us have played for an amateur football club called KF Glory, although Hairi and Gael are the most active with that. SHAQ: However, on a day when we are completely free, you’d probably find us spending time with the family and catching up with friends. Other than that, chores. 6. There are loads of the stereotypes of local music, like it’s trying too hard to copy Western music etc. – what do you all have to say about that? To all the local bands out there hustling, ALL music is influenced by something else. This is the chain that binds us. Just follow your heart and don’t worry about what people say. 7. Who is the band’s all-time music inspiration? FUAD: Gosh there are just too many to mention. Personally, I would have to thank Nirvana for breaking down the walls for the rest of us oddballs to have the freedom to express our true selves. 8. If you’re given a choice to do change anything you want for a day, what is the one thing which you’d like to change about the local music industry? HAIRI: If just for a day? For all local media/stations to pay tribute to local music. Example, a radio station dedicating one full day to playing Malaysian music only. More emphasis given on local artists by the local English radio stations. 9. What’s the best advise you’d like to give to all our local talents who are striving to be recognized in the music industry? SHAQ: Do what you feel is right, stand out for being yourself and get recognized for being you. Don’t doubt yourself, and remain humble. To learn more about the release of Kyoto Protocol’s upcoming album this GVF2018, stay tuned to their Instagram and website for more deets!